One of the benefits of doing speaking events around the state for my book "Finding the Fountain of Youth" is getting to visit interesting places. Last year I spoke on the tiny island of Matlacha and in the amazing mid-century modern auditorium at Tampa's downtown library. 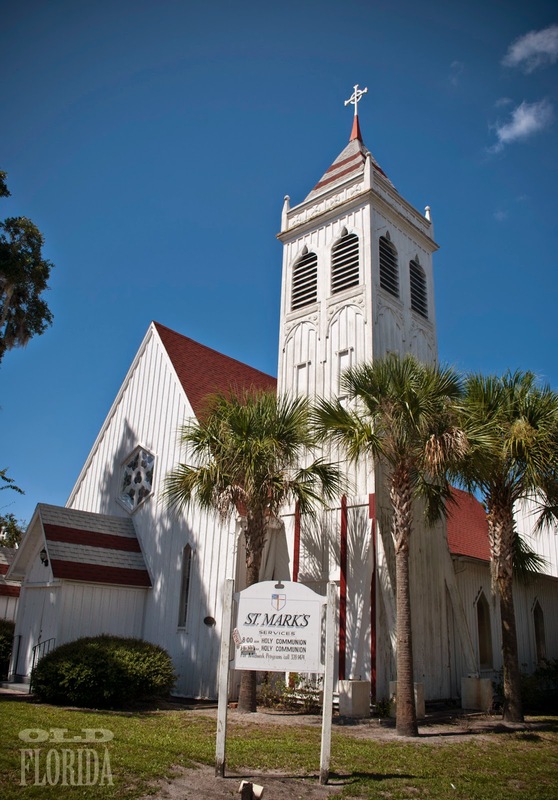 This year I've discovered the Heritage Village in Largo, the historical museum on Amelia Island and most recently I spoke at a small church for the Garden Club of Ft. Meade. The ladies of the Garden Club saw an article about my presentation at the Polk County History Center in nearby Bartow and invited me back to "Imperial Polk County." 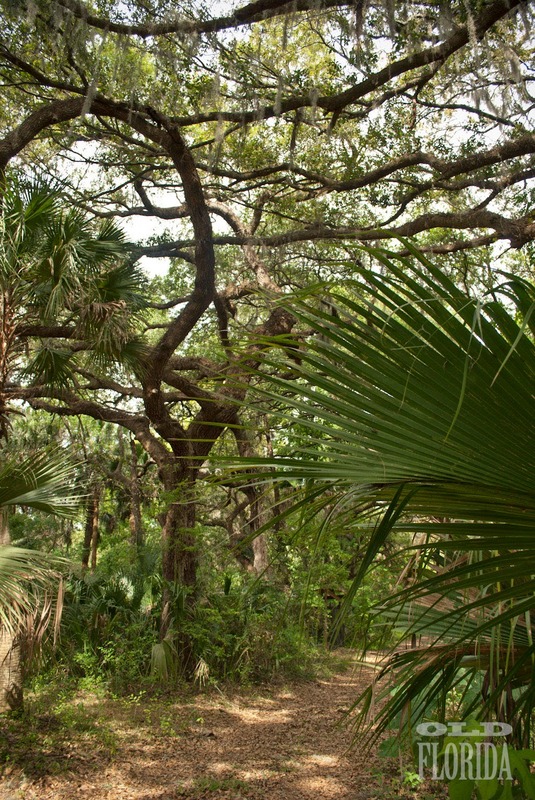 Ft. Meade's origins go back to the Seminole Indian Wars when a fort was established at the town's location to protect a nearby homestead and because it was geographically half way between the Gulf of Mexico and Atlantic Ocean. The fort was named after its founder Lt. George Gordon Meade, an "aggressive" soldier who gained fame for commanding Union troops at the Civil War battle of Gettysburg. 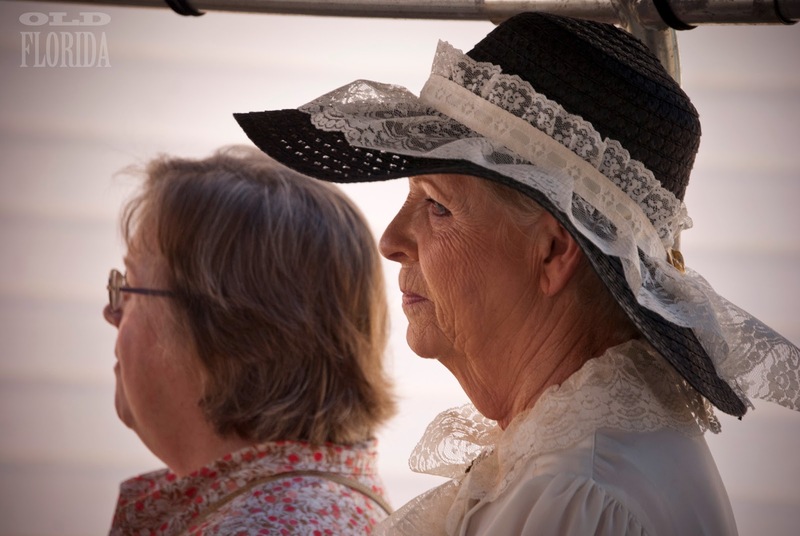 Today Ft. Meade is in the heart of phosphate mining operations, and according to one Garden Club member, that is what helped the town maintain its historic charm. The large number of mines surrounding the town have actually acted as buffer from the rampant growth and development that has engulfed the rest of the state. A Google maps satellite view of the area surrounding Ft. Meade. 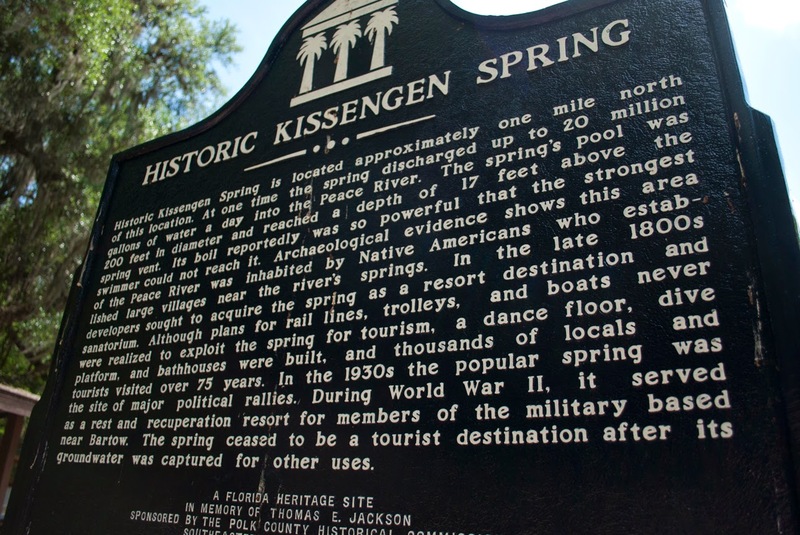 Further north is Mosaic Peace Park with its historical marker for Kissengen Spring. As I arrived for my speaking event I noticed how none of the churches lined up along the main road had parking lots – folks just parked in the grass. The neighborhood surrounding the church had some outstanding historic homes, both modest and grand, and I allowed myself some time to drive around a bit and take a few pictures. 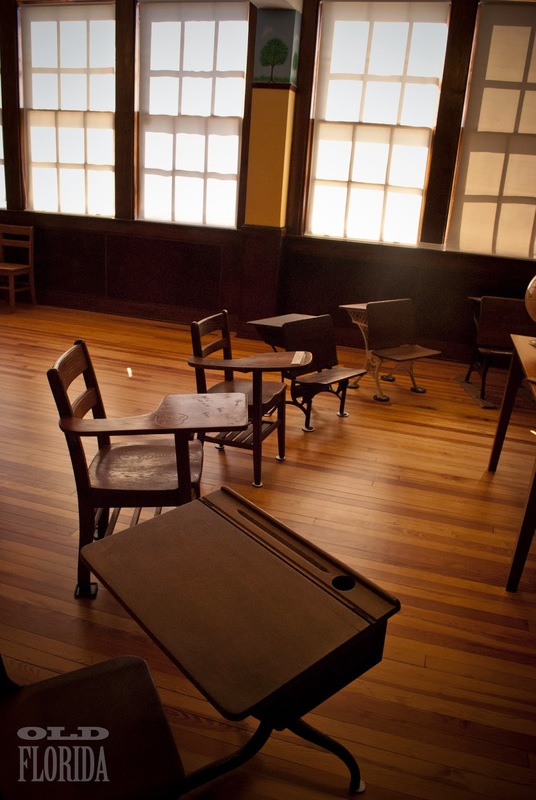 After my speaking event I visited the small museum located in Ft. Meade's first indoor school building. 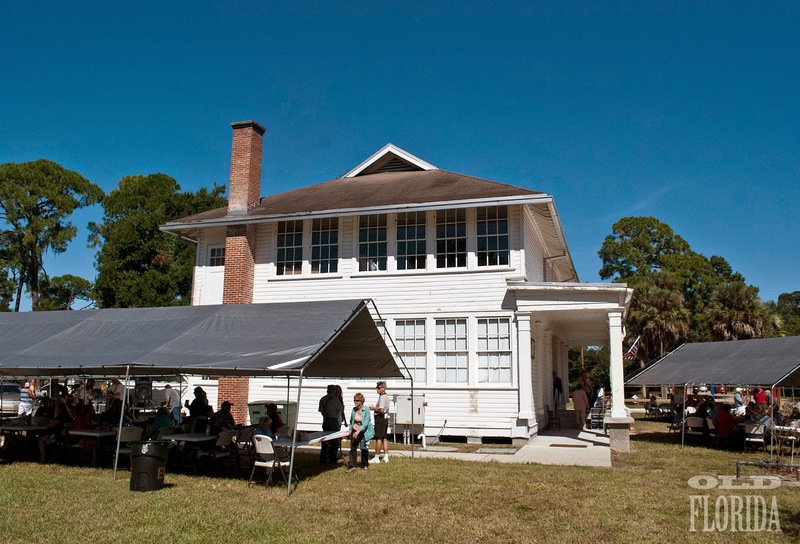 The 1885 structure also served as a boarding house and it opened to the public as a museum in September of 2000. 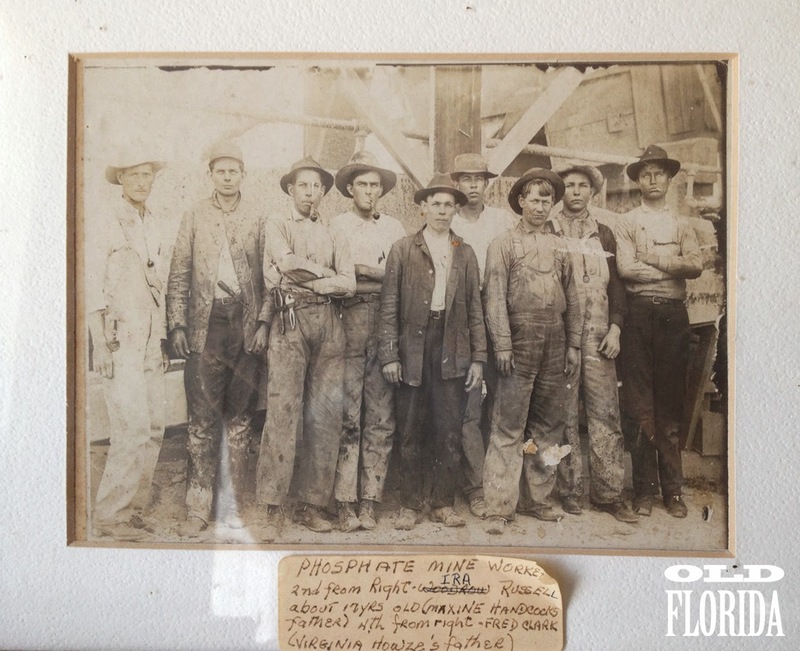 Packed with artifacts and photos from the area's past, the museum tells the tale of this community that is so closely tied to the mining industry. 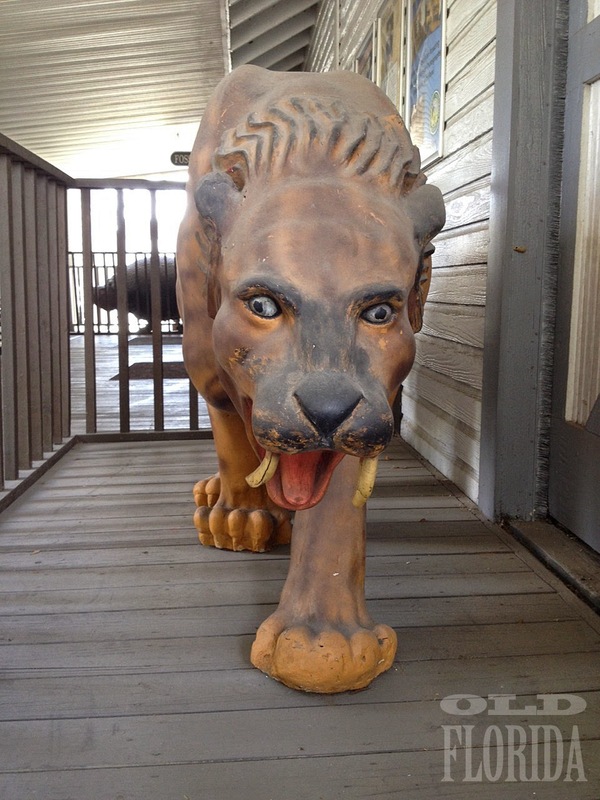 Image from the Ft. Meade Historical Museum. According to wikipedia, phosphate refers to rock or ore containing phosphate ions that are mined for use for industry and agriculture. Ft. Meade is located in what is known as Bone Valley, an area comprising portions of Hardee, Hillsborough, Manatee and Polk Counties. The name Bone Valley refers to the deposits of fossilized bones, many of which have been discovered during the phosphate mining process. 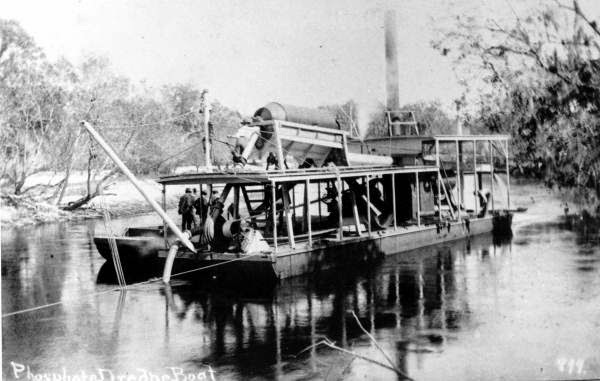 The phosphate was accidently discovered by Captain Francis LeBaron of the Army Corps of Engineers in 1881, when he was surveying the Peace River for a route to connect the St. Johns River to Charlotte Harbor. At first mining was done on sandbars in the Peace River, but eventually dredges were used. 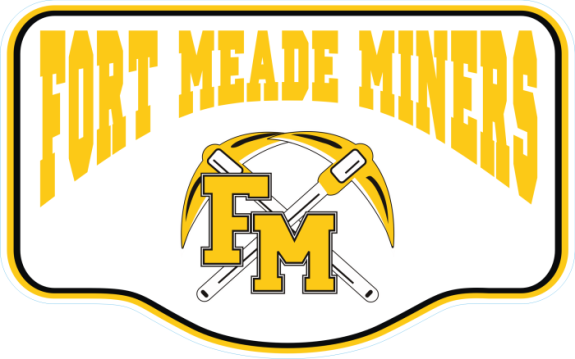 It's impossible to visit Ft. Meade without seeing the evidence of the mining operations from the enormous piles of mining waste byproducts stacked by the road, to the logo for the local high school nicknamed the "fighting miners." 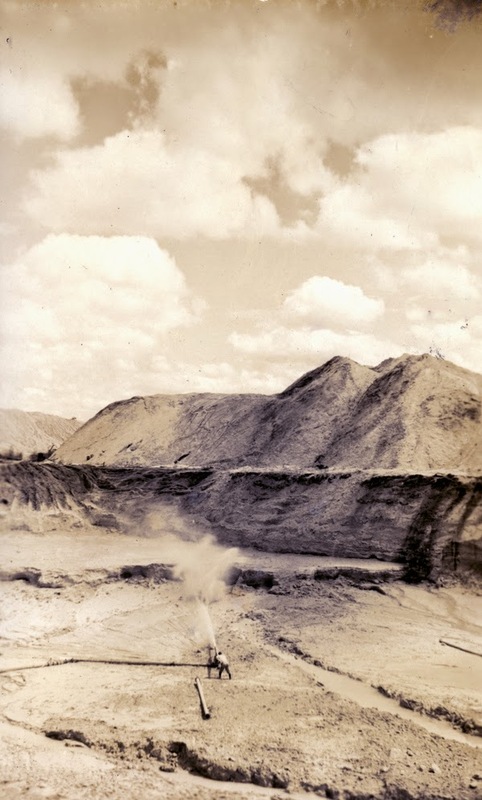 Phosphate mining – location unknown. 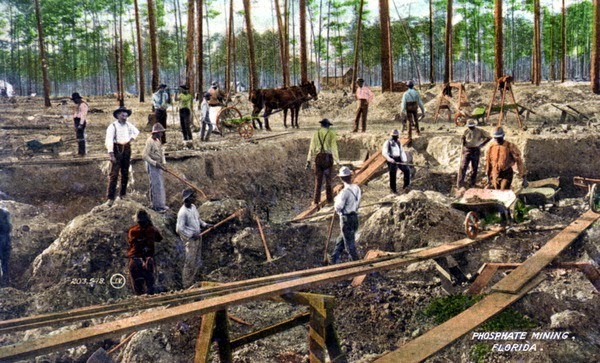 Phosphate mining postcard, State Archives of Florida. 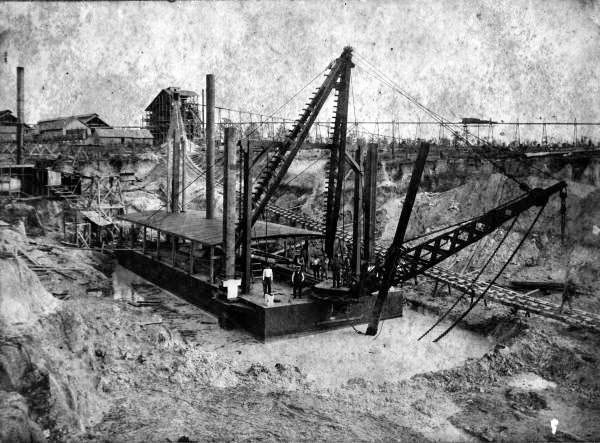 Phosphate dredge boat, circa 1890s. A month earlier after a speaking in engagement in nearby Bartow, I visited the Phosphate Museum in the tiny town of Mulberry. I knew of the museum only though my discovery of wonderful photos showing vintage dinosaur murals at the museum in the state archives. 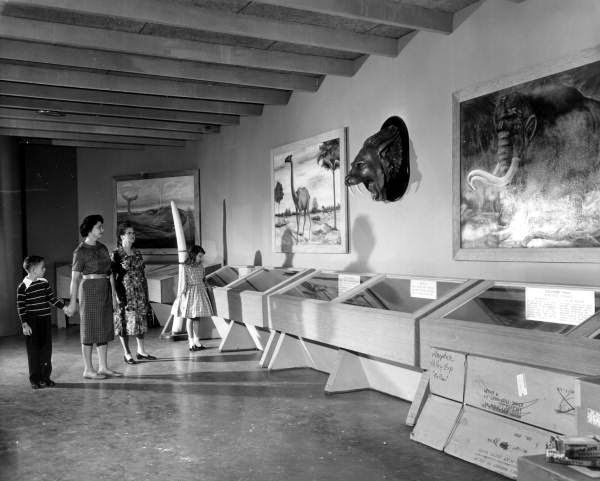 Visitors viewing an exhibit at the Phosphate Museum - Mulberry, 1960. 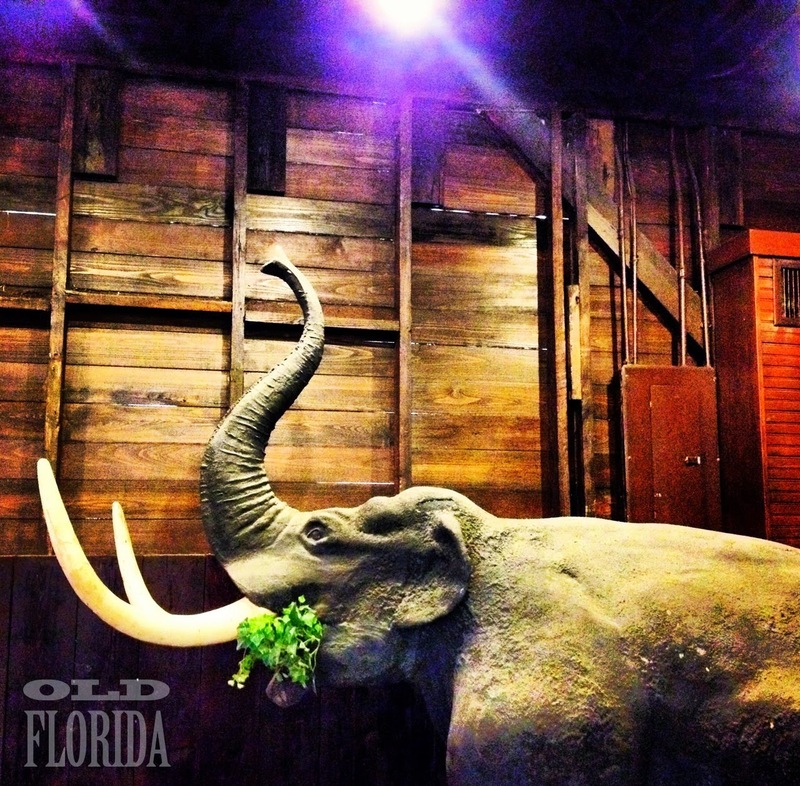 "The bones of these creatures plus remains of numerous sea animals are found in the vast phosphate deposits of central Florida. 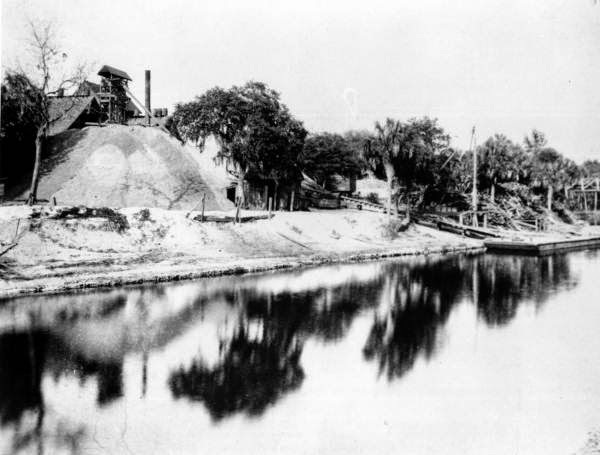 Florida supplies three-fourths of the nation's phosphate." 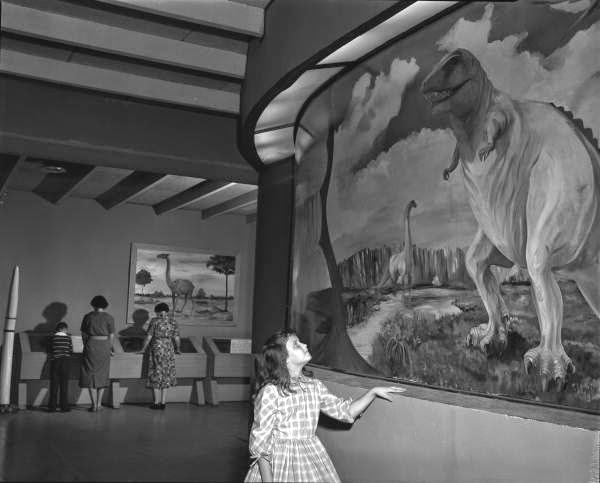 Child viewing painting of dinosaur on display at the Mulberry Phosphate Museum, 1950s. Contemporary images from the Mulberry Phosphate Museum. 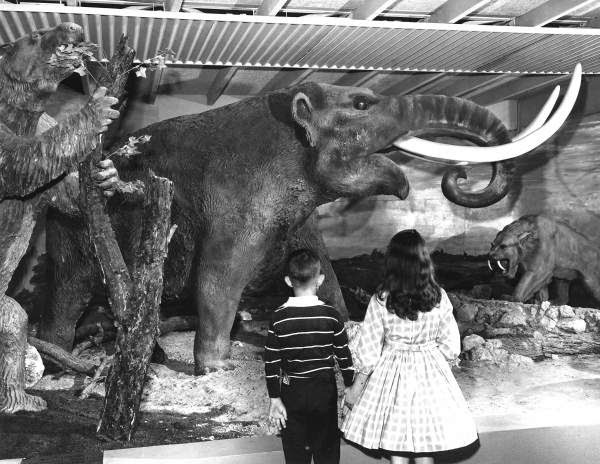 While the dinosaur murals were gone, the museum was packed with fossils and full size replicas of a mastodon and a saber tooth tiger. There was also a new wing created by Mosaic, the giant phosphate mining corporation. It was a charming museum, as was the one in Ft. Meade, with lots of information about the industry that dominates this region of Florida. 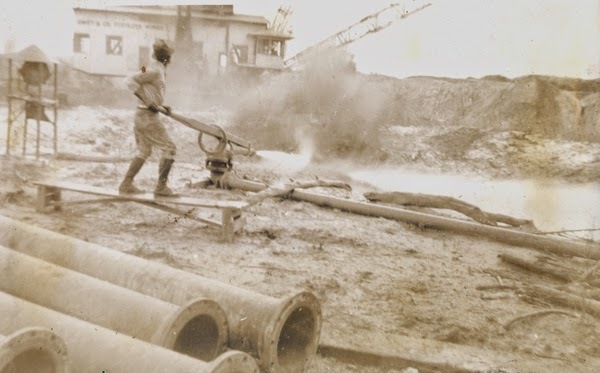 Swift & Co. miner creating slurry with pressurized water at a phosphate rock mine south of Ft. Meade, 1941. State Archives of Florida. 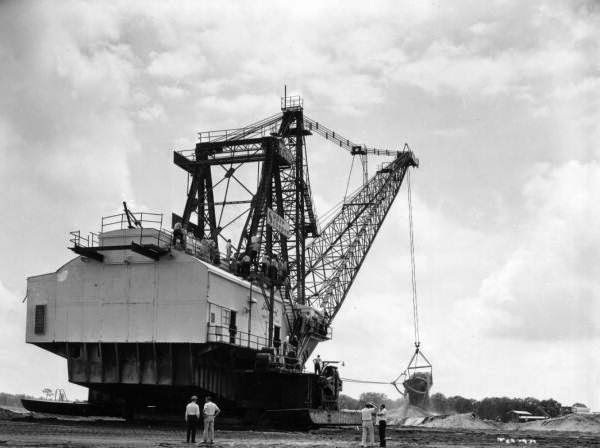 Farm writers see "Super Scooper" in action at the Noralyn phosphate mine, 1956. 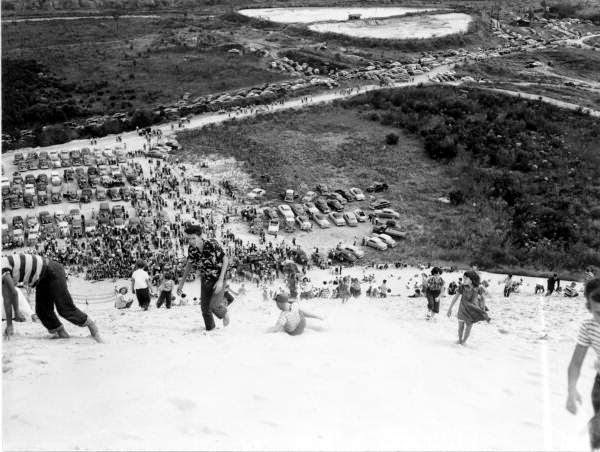 "If you grew up in Polk County, Florida in the 1950s or 1960s you remember the man-made phenomena, Sand Mountain." - Lake Wales Public Library. 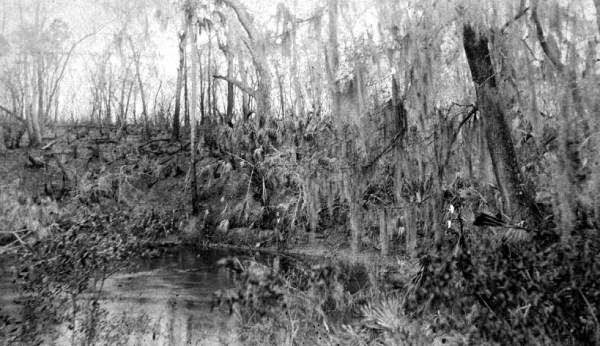 Photo from the State Archives of Florida. Interestingly at the museum in Ft. Meade there was little about about Sand Mountain. "Created for recreational usage from the sand dredged in the phosphate industry, Sand Mountain was a favorite weekend spot for locals." according to the Lake Wales Public Library. 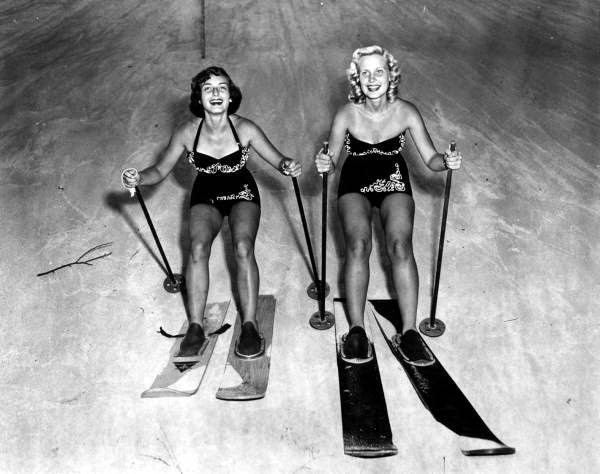 Skiers on Sand Mountain, State Archives of Florida. The mountain was a byproduct of mining operations. At both lectures I spoke about Kissengen Spring, the spring that lost almost all of its water flow when its water was "captured for other uses." Members of the audience remembered this spring that dried up in the 1950s. 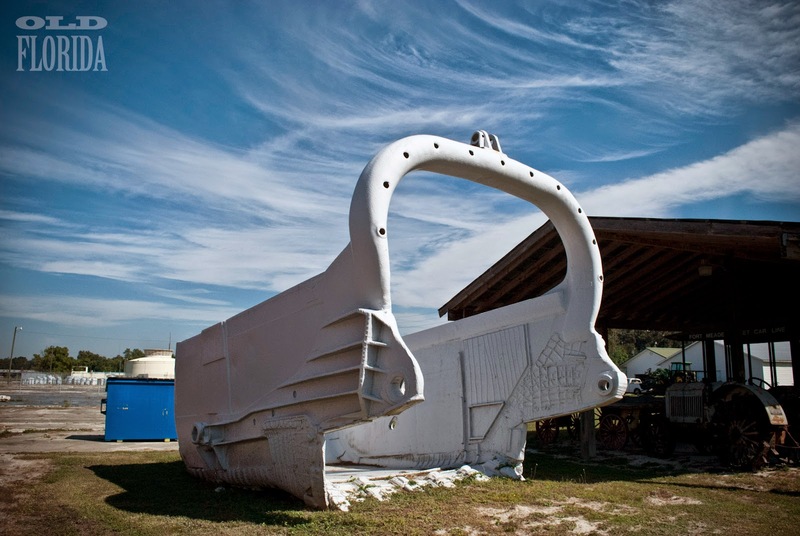 Phosphate mining has been part of this part state for generations and I find its history fascinating. But I believe it is of critical importance that we use what happened to this community's treasured spring as an example, so that we never make the same mistake again. 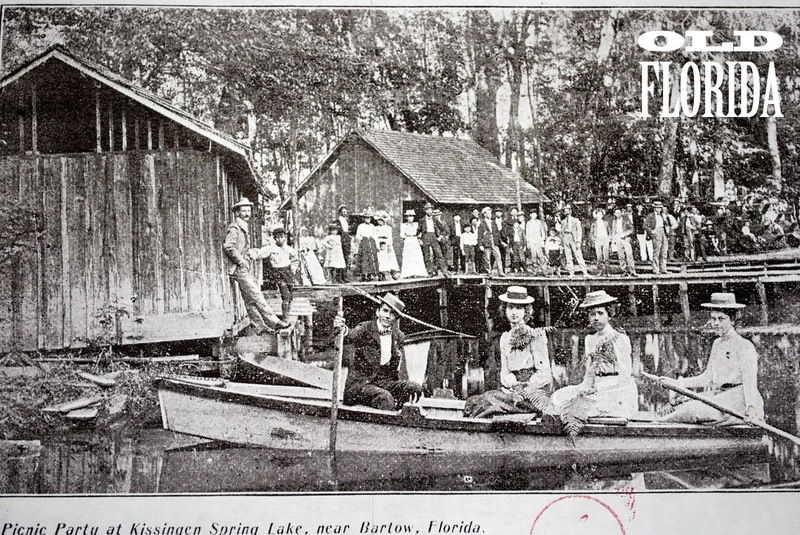 Detail from newspaper article about Kissengen Spring from the Polk County Historical Society. 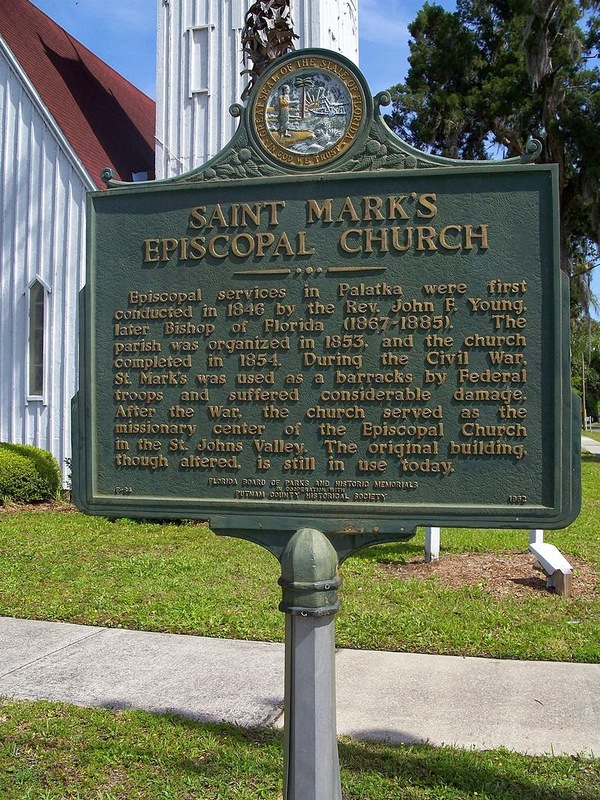 This historical marker is located at Mosaic Peace Park between Bartow and Ft. Meade. 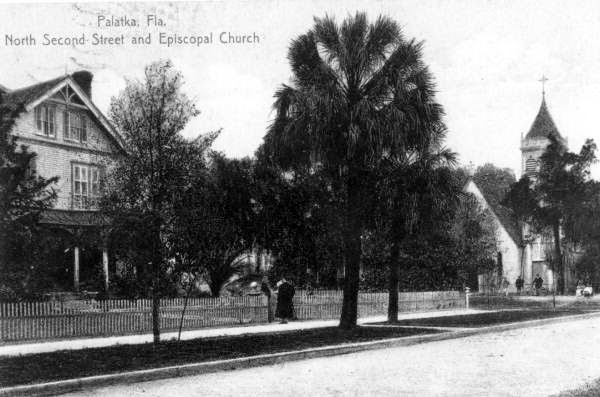 image from the Polk County Historical Society. John Moran photo at the site of Kissengen Springs. Attendees of both Polk County lectures seemed receptive to my message documenting the decline I had witnessed in Florida's springs. 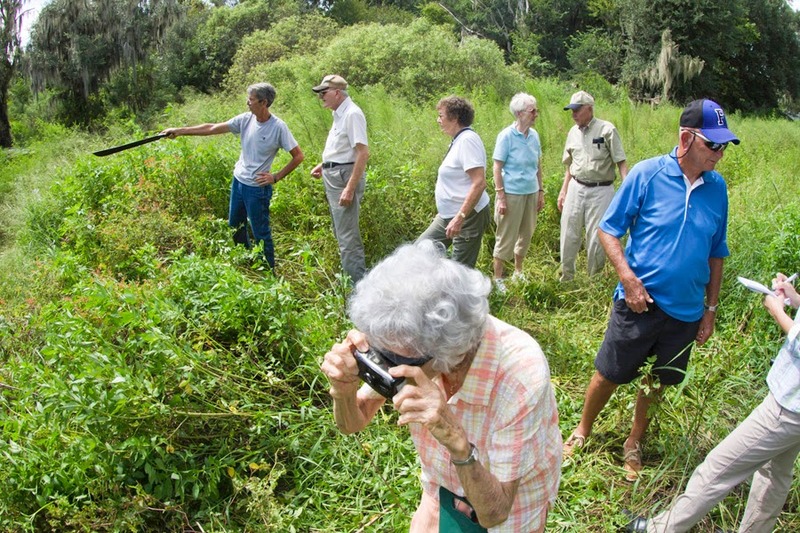 The ladies of the Ft. Meade Garden Club were on board with support of Amendment 1, the Florida Water and Land Legacy, an effort to ensure that there are no more 'disappearing' springs in the future. 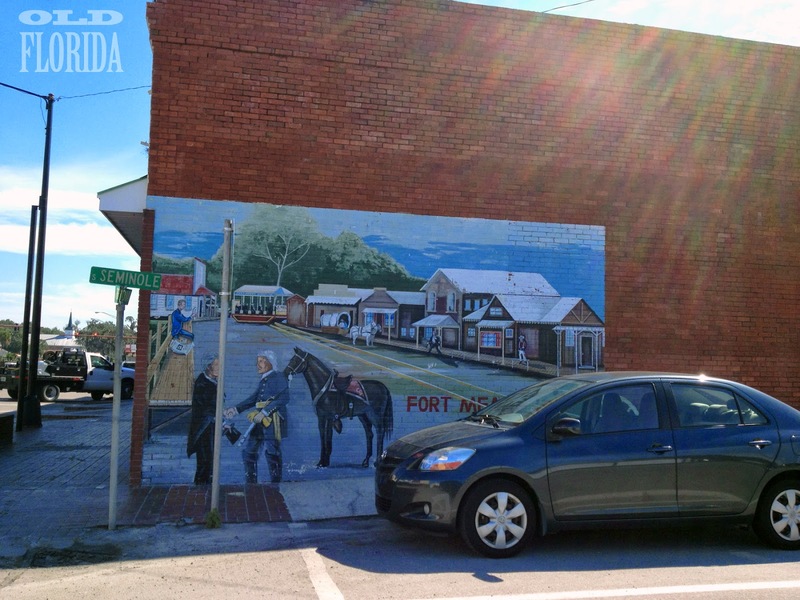 As I explored the charming town of Ft. Meade, I felt buoyed in my determination to get my message out, encouraged by the support of the sweet little old ladies in the heart of phosphate country. 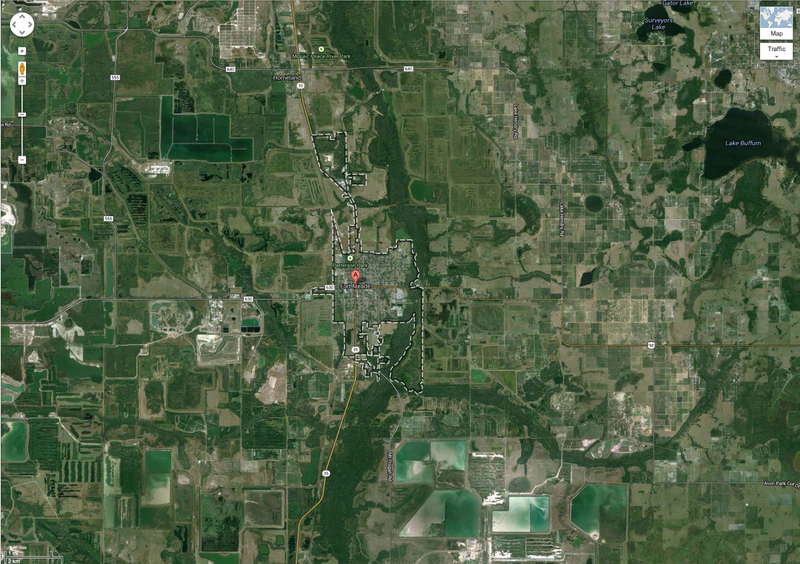 It was March of the year 2000 and the quickly expanding city of Deltona was considering annexing the tiny town of Enterprise into their city limits. Deltona was a relatively recent invention, founded by the Mackie Brothers as a retirement community called Deltona Lakes in 1962. By the end of the 20th century it had eclipsed Daytona as the most populous city in Volusia County. Concerned citizens of historically rich Enterprise gathered and the result of that meeting was the creation of the Enterprise Preservation Society. 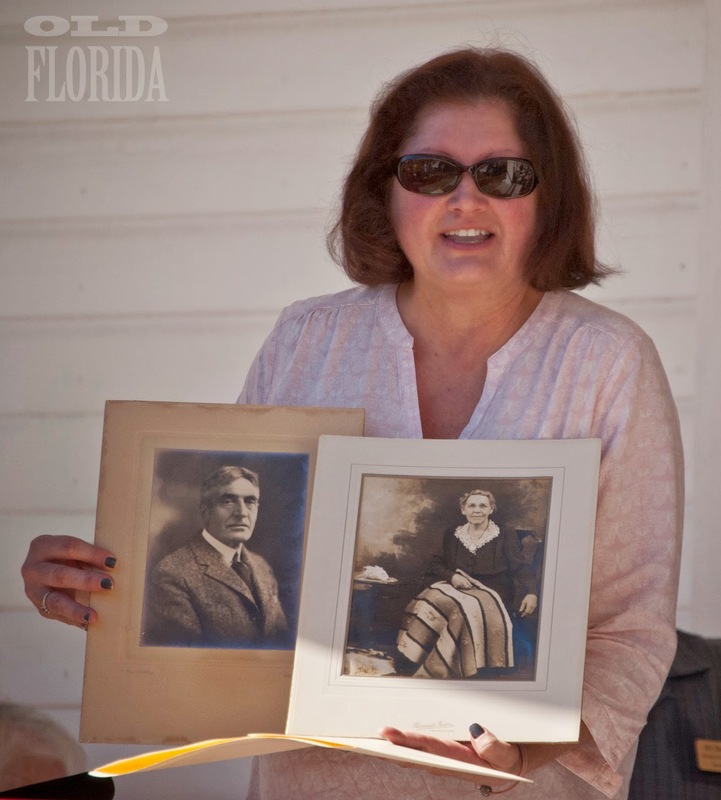 Their first act was to survey residents and they learned that folks living in Enterprise had a strong desire to keep the town's history alive. 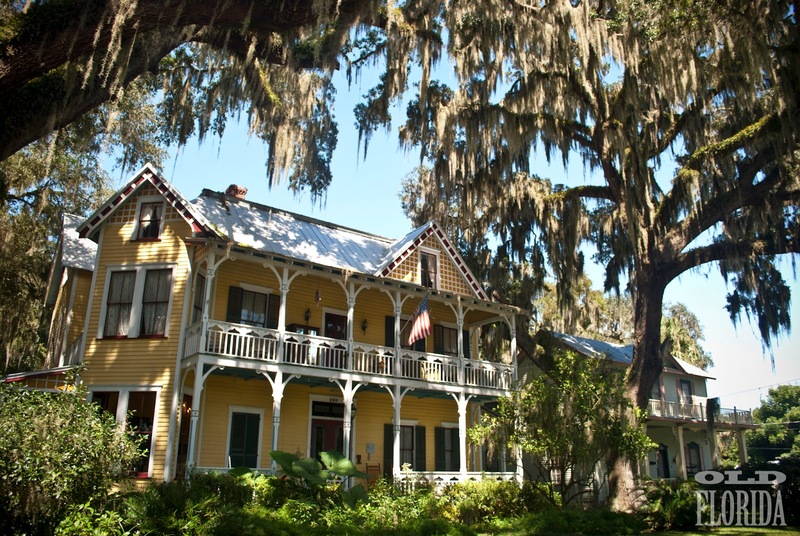 In 2006 Volusia County approved a "historic overlay which designates Enterprise as a historic village" according to wikipedia. The area was originally settled by indigenous people thousands of years ago, evidence of which was found in large shell middens deposited in the area. An image of the "Enterprise Mound" was reproduced in a 1875 book by Jeffries Wyman. 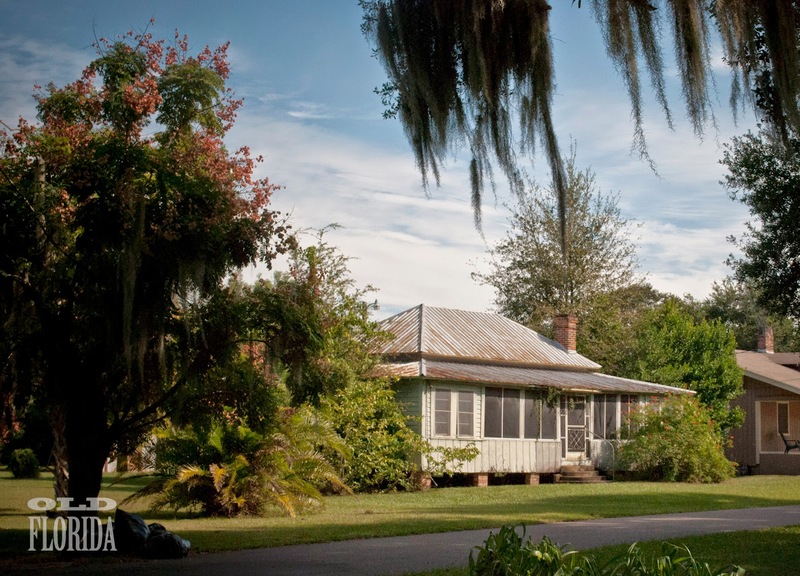 During the Seminole Wars of the 1800s, a defensive encampment known as Ft. Kingsbury was erected in Enterprise to protect the area from attacking Seminoles. 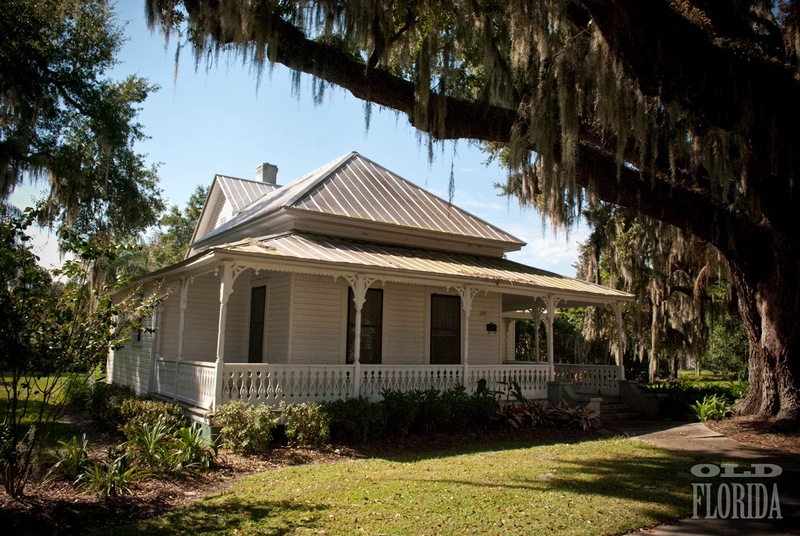 Even though large plantations existed up and down the St. Johns River since the 1700s, a group of settlers led by Cornelius Taylor homesteaded in the area in the 1840s, establishing the foundation for the future town. 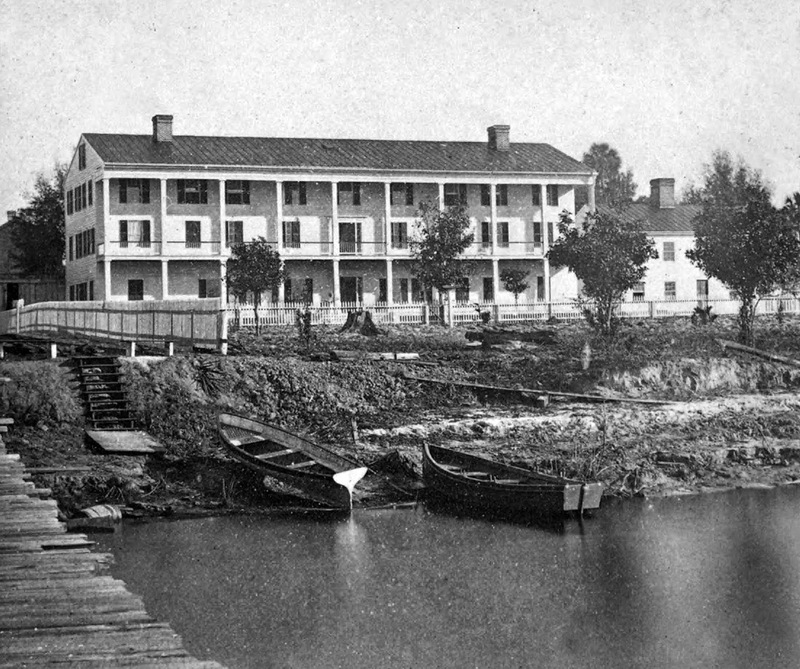 Taylor built one of the earliest hotels for guests to take the waters near Green Springs on the north bank of Lake Monroe. Enterprise became the county seat of the enormous Mosquito County in 1843 (the state originally had only two counties: Escambia to the west and Mosquito to the east.) Mosquito County included the present Volusia, Brevard, Indian River, St. Lucie, Martin, Osceola, Orange Polk, Seminole, Lake and Palm Beach Counties. For a brief time Enterprise was also the county seat of Volusia County as well. 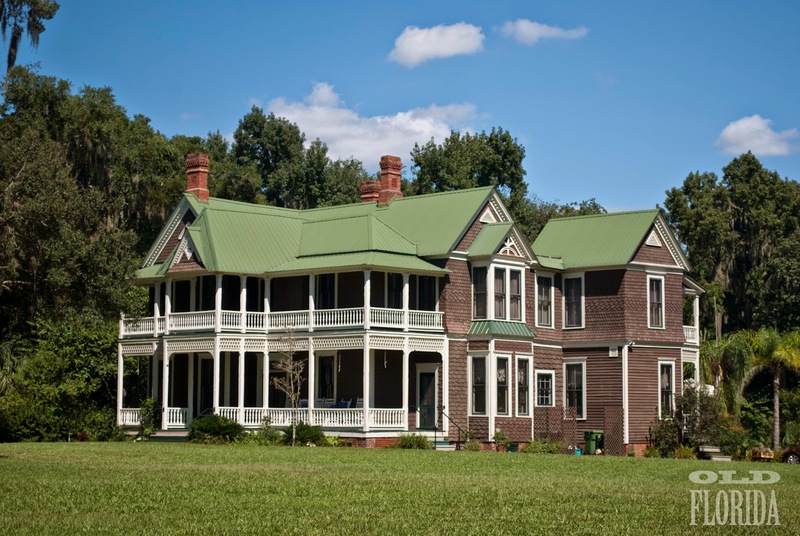 The Brock House was host to famous folks like Grover Cleveland, Ulysses S. grant, General William Sherman and a host of Vanderbilts and Rockefellers. State Archives of Florida. 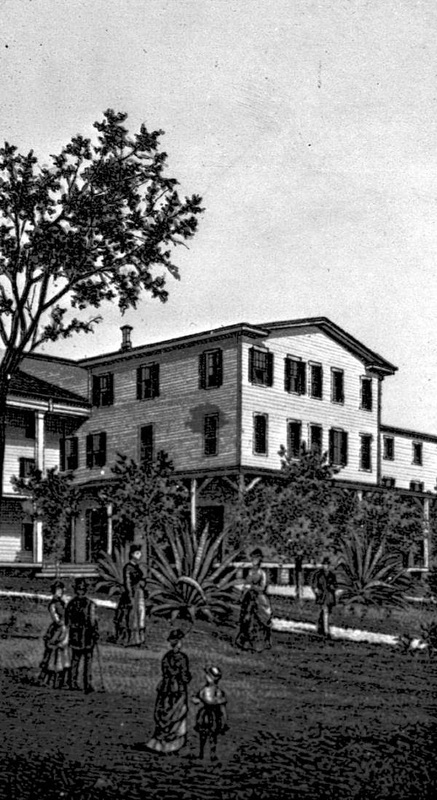 Engraving showing visitors to the Brock House, State Archives of Florida. 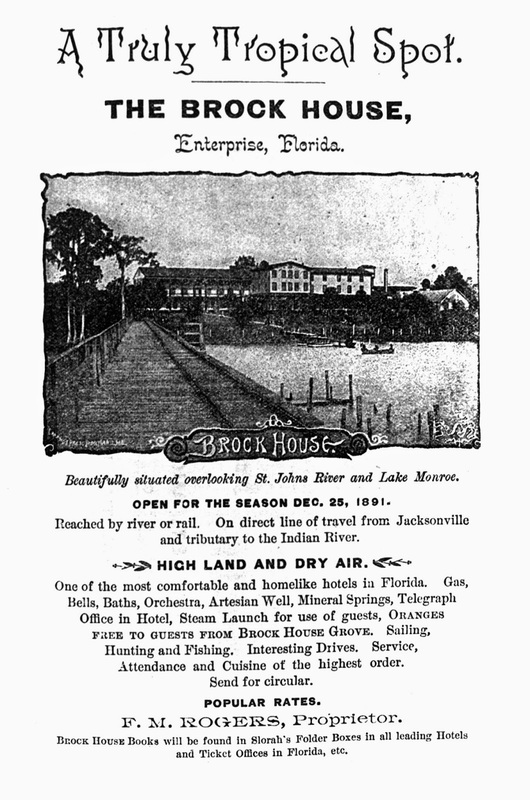 In 1856, steamboat captain Jacob Brock built a 100-room wooden hotel in Enterprise, known as the Brock House. 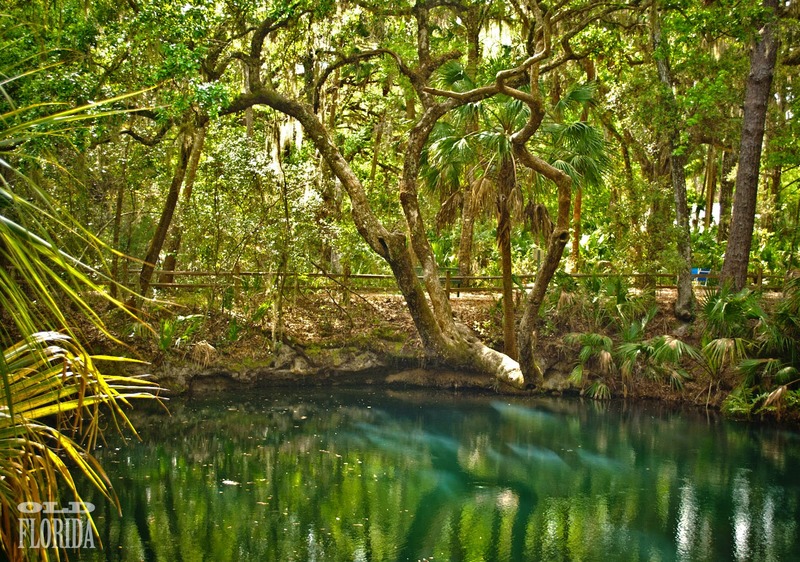 Nearby sulphur springs were offered as an amenity for visitors for those seeking to take the waters for health purposes. The hotel was later renamed the Benson Springs Inn. 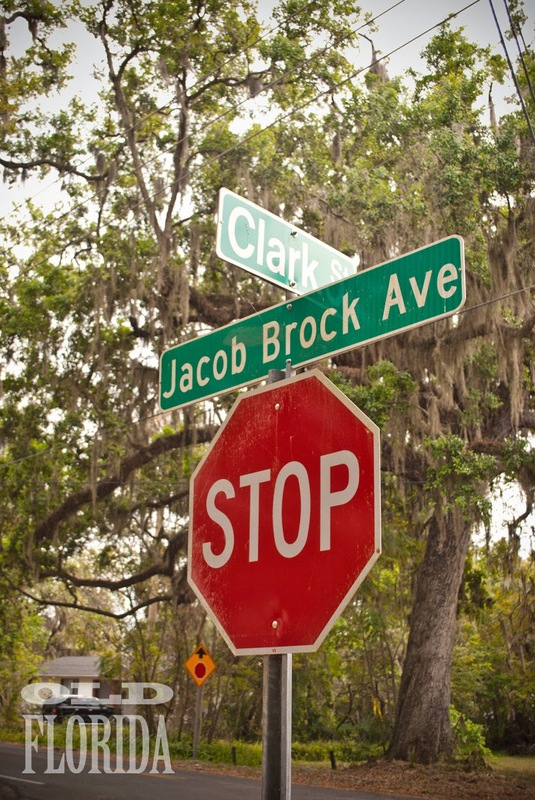 Jacob Brock's influence lingers throughout Enterprise, even today. 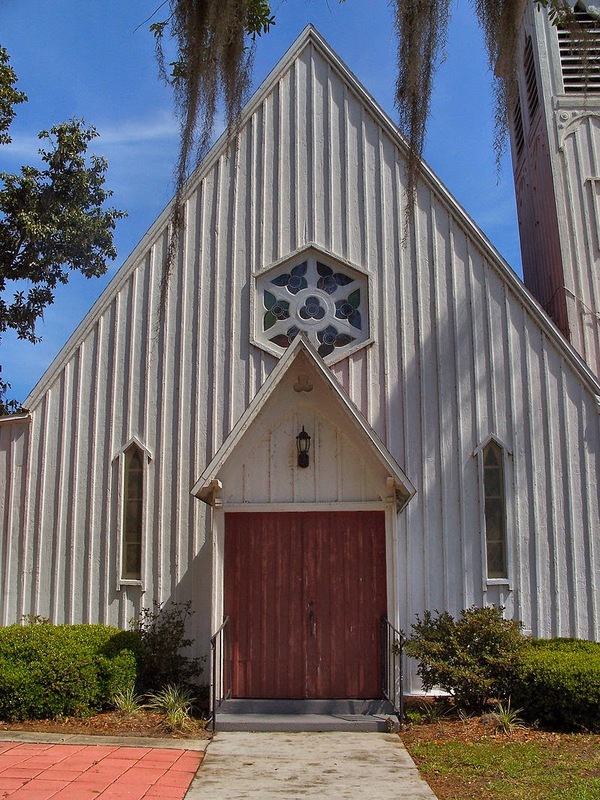 Board and batten Carpenter Gothic church close to the former location of the Brock House. 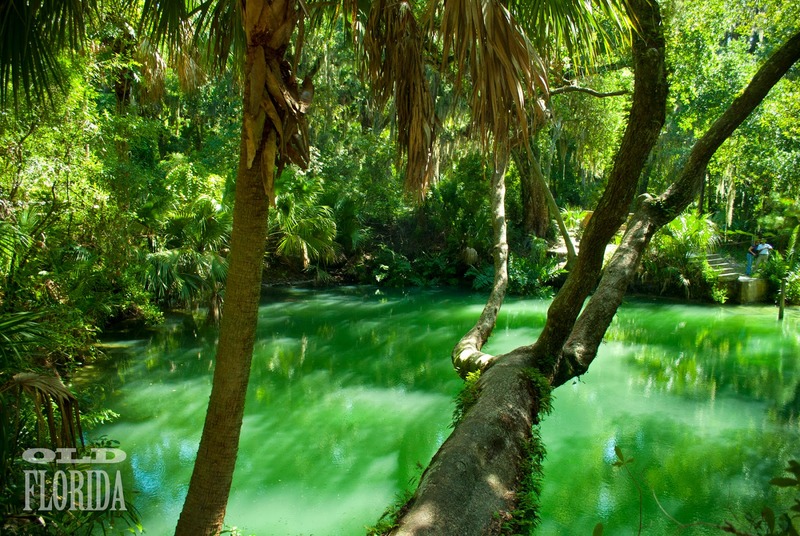 The mineral laden waters of nearby Green Springs. 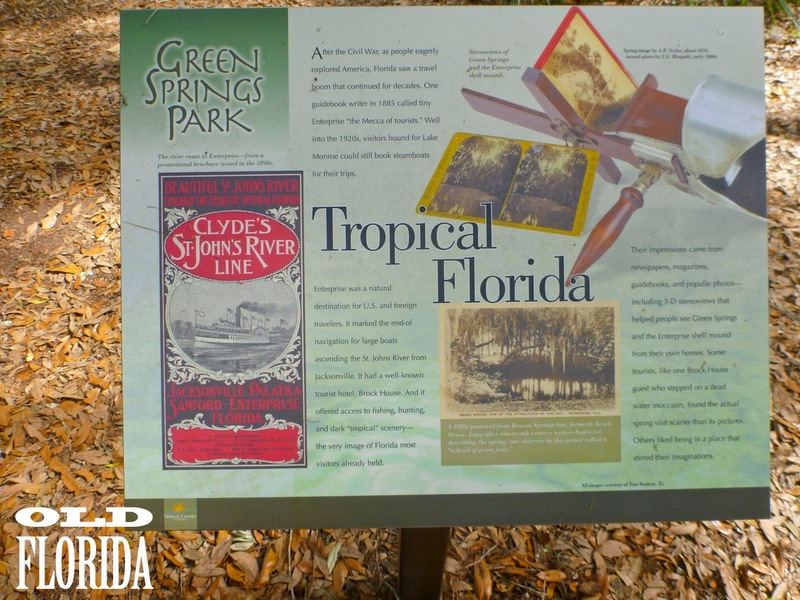 Green Springs is located in a beautiful Volusia County Park. but more recently it was used a local swimming hole. 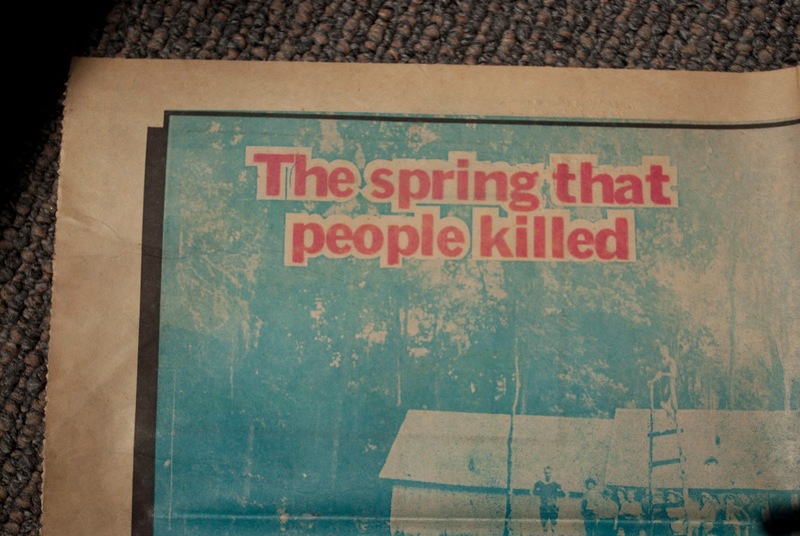 Interpretive signage explains the spring's history. 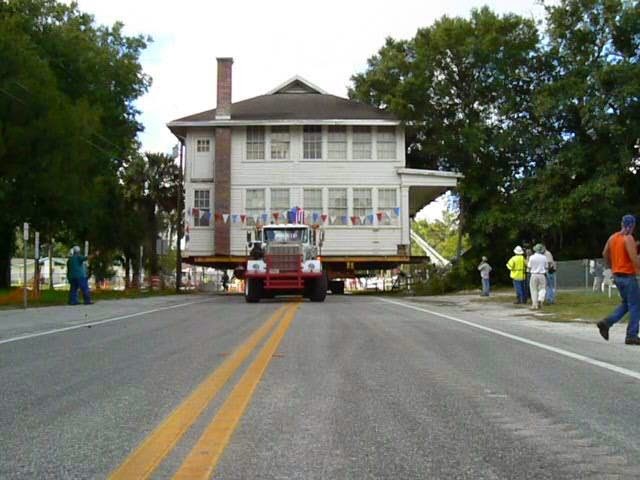 In 2004 the Enterprise Preservation Society took possession of a 1930s schoolhouse from Volusia County and moved it 500 feet down the road. They have painstakingly restored the two-story building, filling it with displays highlighting Enterprises fascinating history. 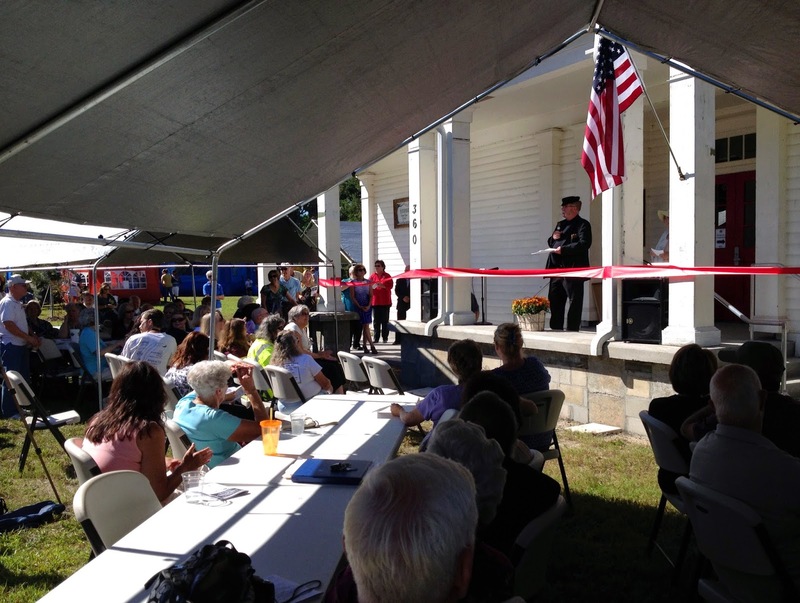 The grand opening of the Enterprise Heritage Center and Museum this past weekend was marked with speeches, re-enactors, bluegrass, and barbecue. Everyone seemed jovial on this warm autumn day, with good reason. 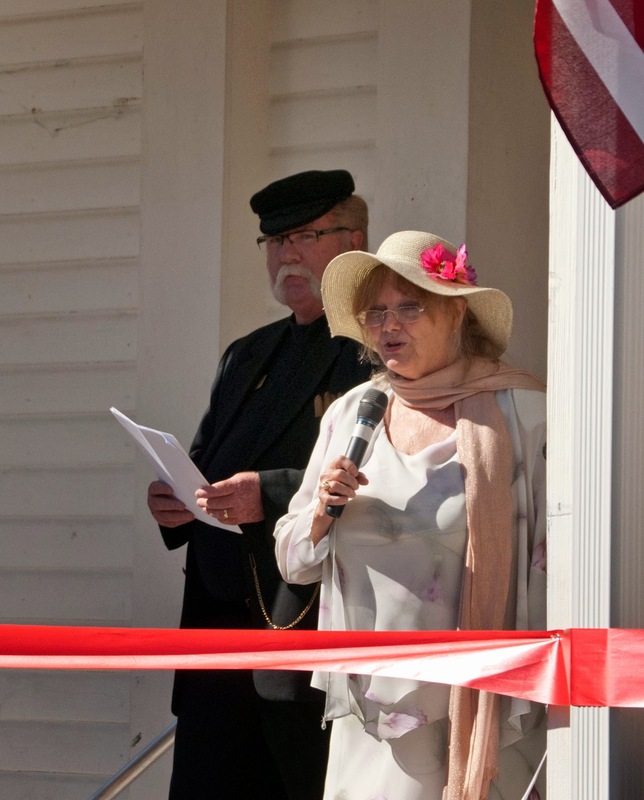 A small group of individuals came together to pull of the Herculean task of moving and restoring a building, preserving a community's history, and keeping their town from being assimilated into one of the fastest growing cities in the state. That's an accomplishment worthy of a celebration! 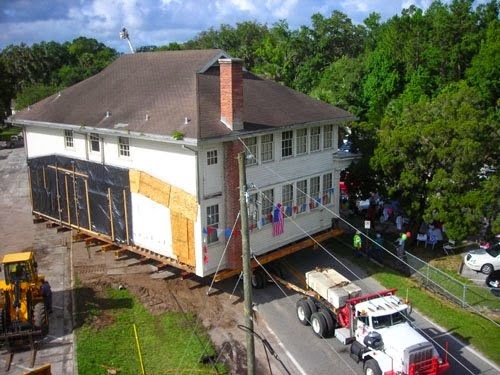 Moving the schoolhouse. Images courtesy Kevin Finn. Mark Matzinger dressed as Jacob Brock led the festivities. of the Enterprise Heritage Center and Museum. Folks really know how to dress for an occasion in Enterprise! 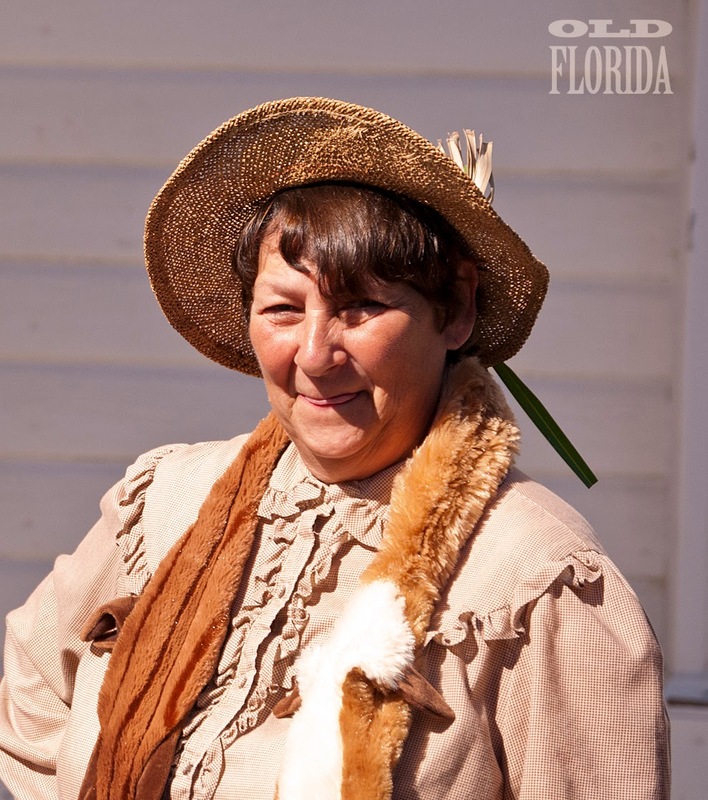 Re-enactor portraying a comical Florida Cracker. of notable Enterprise citizens from the past. 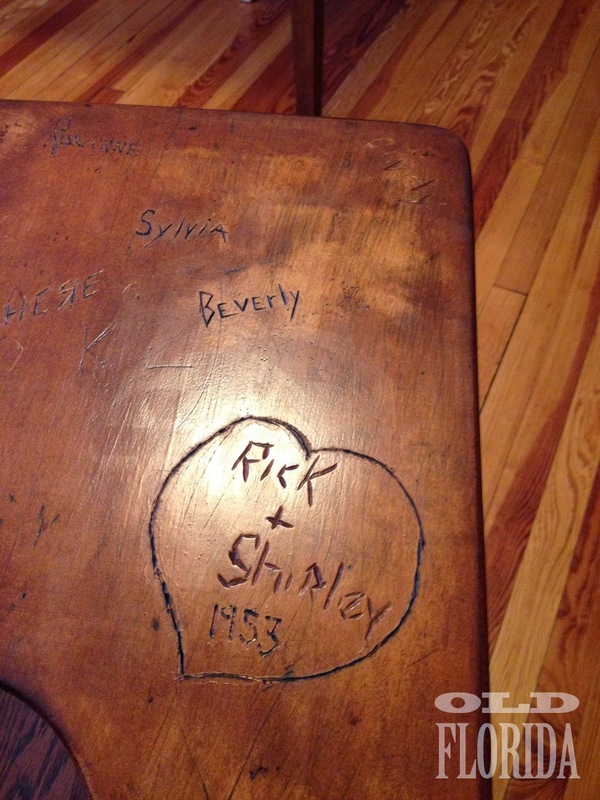 Detail from a desk in the schoolhouse. Steamboats docked in Enterprise - photo in the Enterprise Heritage Center and Museum. Tuesday and Friday 11 am to 3 pm; Saturday 9 am to 1 pm. 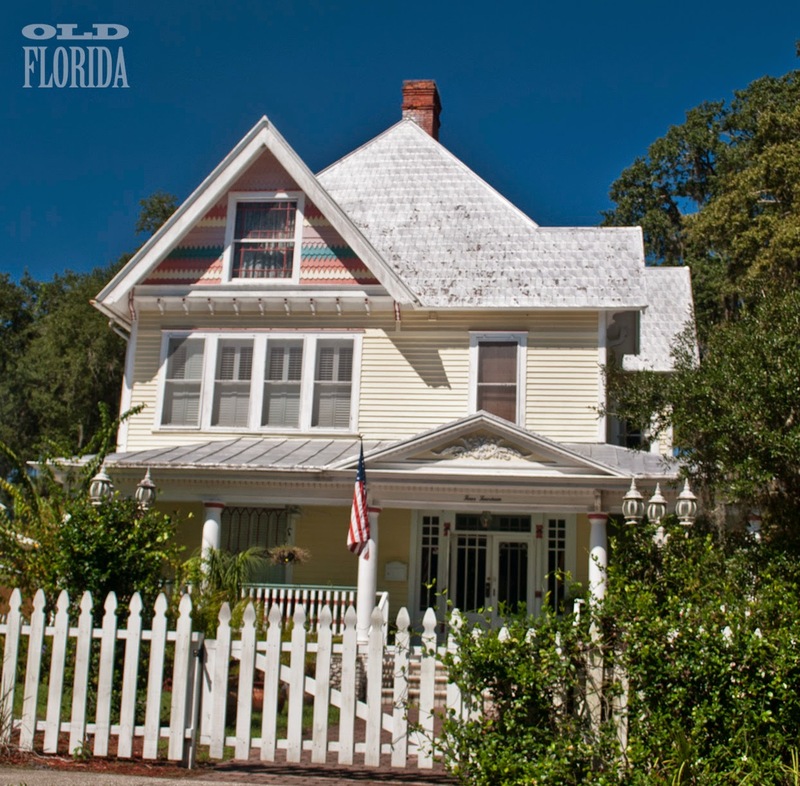 My first house was a 1947 wood frame bungalow in Orlando. Despite my best efforts, every year I had to replace pieces of wood siding. My current house, built in 1924, has fared better because its cypress cladding is covered with layer of ugly, yet durable vinyl siding. Yet I still have had to replace my wonderful Old Florida dock, the floor boards on my porch require constant maintenance, and wooden planter boxes seem to melt before my eyes. 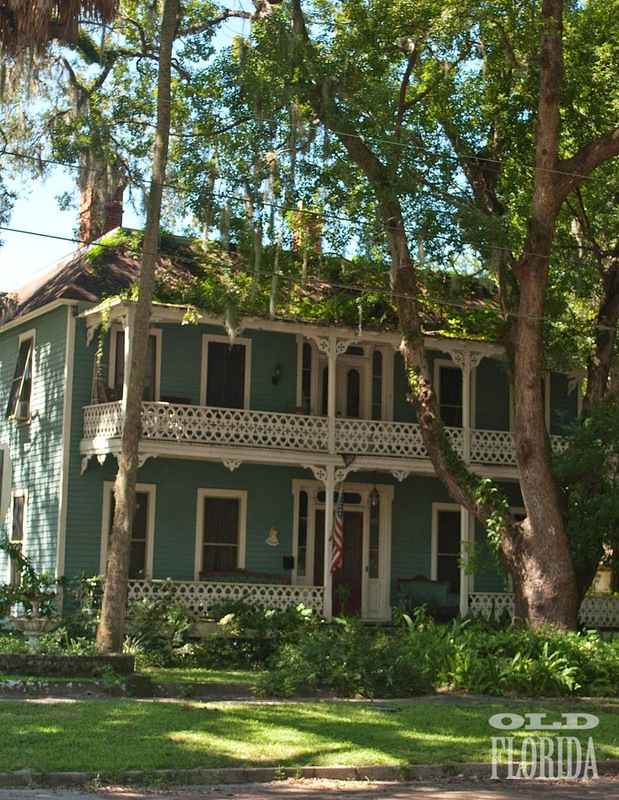 It's hard to preserve wood structures in the sub tropical climate of Florida. Many of the grand historical buildings from that era built out of wood have been lost – enormous resort hotels, elegant Victorian mansions, and early commercial buildings have all burned, been torn down, or simply left to rot. The last grand wooden resort hotel of the railroad age, the Belleview Biltmore in Bellaire near Clearwater, seems doomed. So I am thrilled when I find structures that were built before the Civil War at a time when the state was sparsely populated and only hardy souls could stick it out in this swampy land of mosquitoes and high humidity. Many of these buildings are churches whose congregations lovingly maintained and cared for their houses of worships for decades. 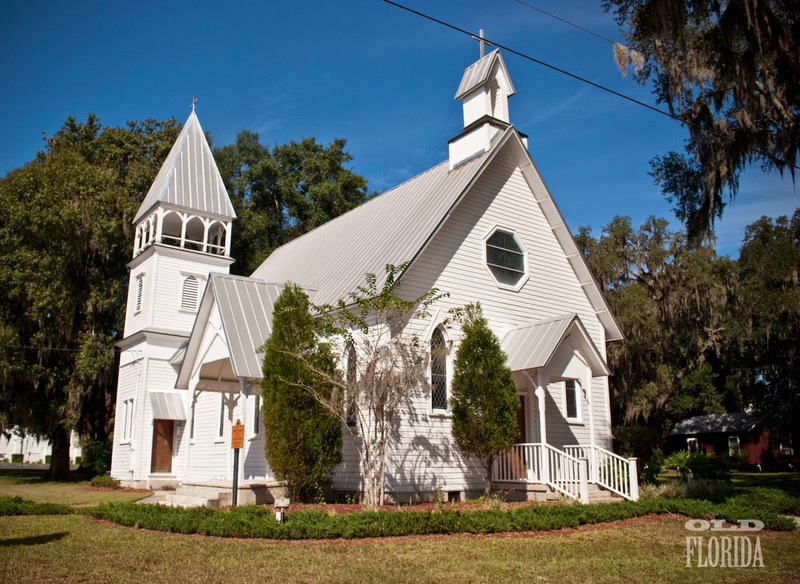 Like the lovely St. Mary's in Green Cove Springs, St. Marks Episcopal Church in Palatka has been around since the middle of the 19th century. 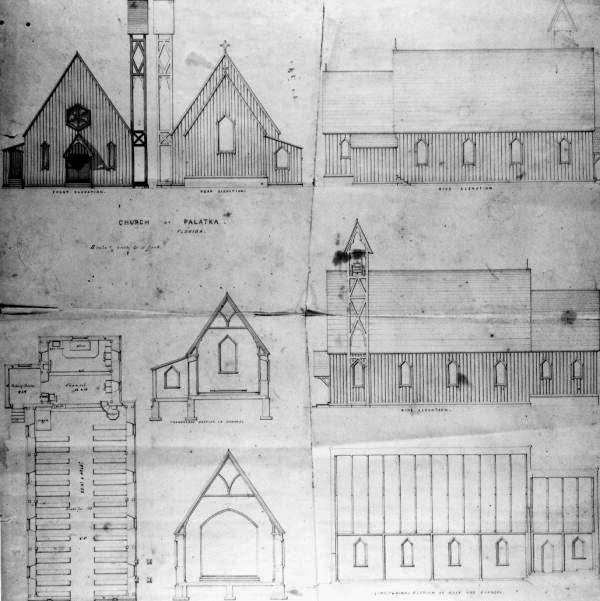 Also a board and batten Carpenter Gothic design, the church is a few blocks from Judge Isaac Bronson's Sunny Point mansion. 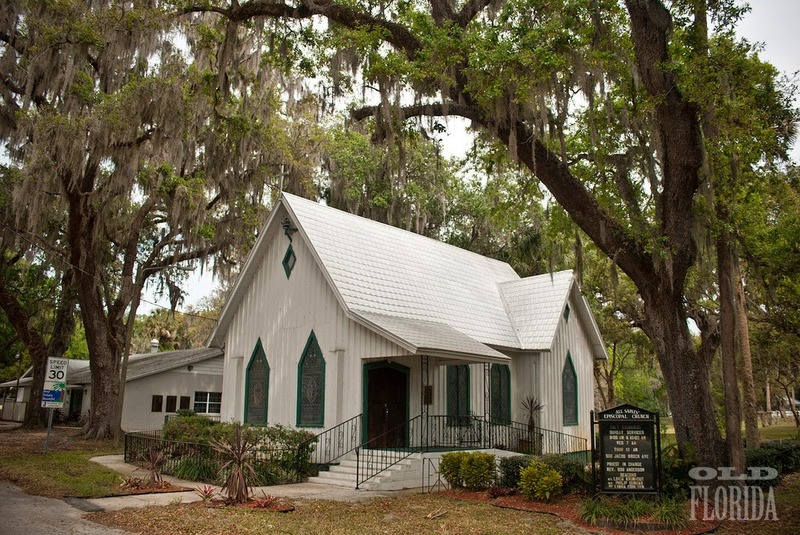 Bronson, as well as Judge James Burt and Florida's first Governor William Dunn Mosely, were instrumental in the creation of the church in 1854-55. 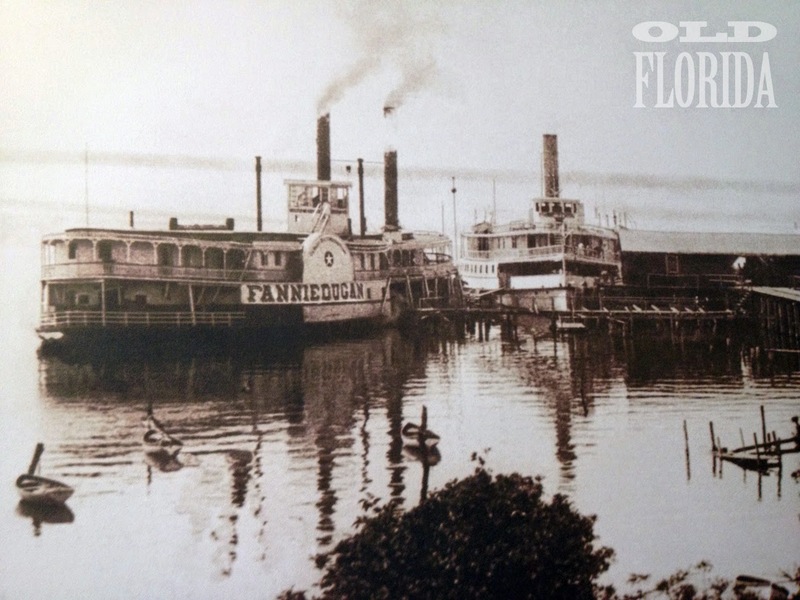 Before the Civil War, services were only held during the cooler winter months, evidence of Palatka's status a riverside resort destination for Northerners. 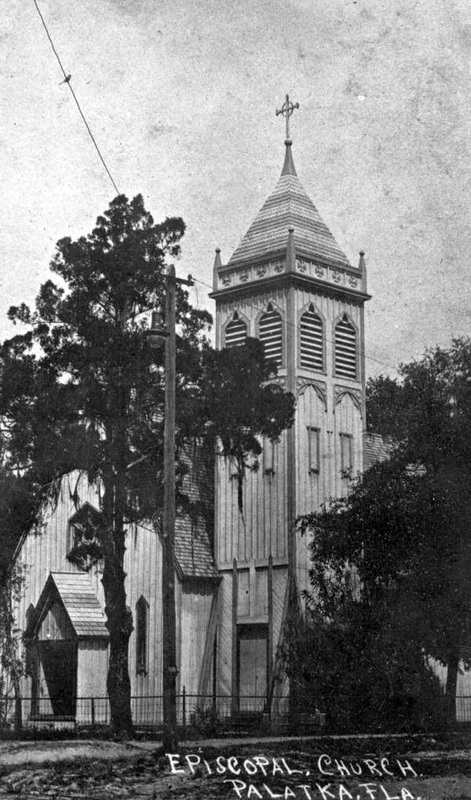 During the War the church was occupied by Union troops who are said to have damaged the structure. 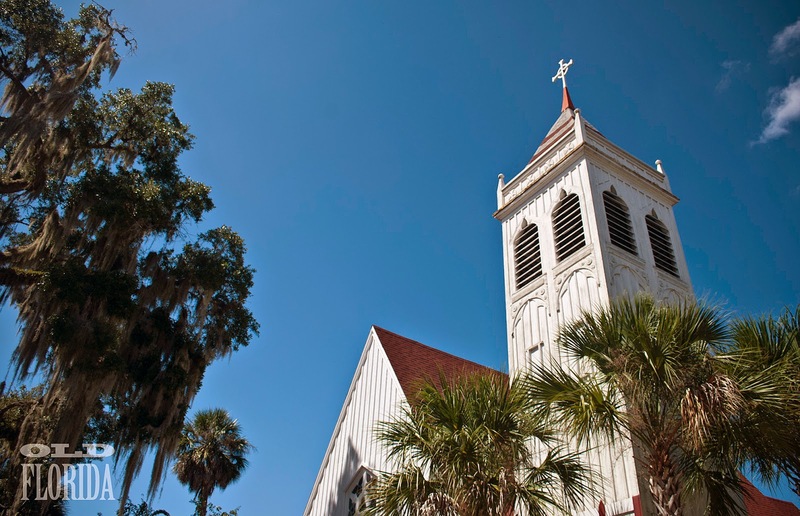 The church received full parish status in 1873 and was added to the National Historic Register in 1973. 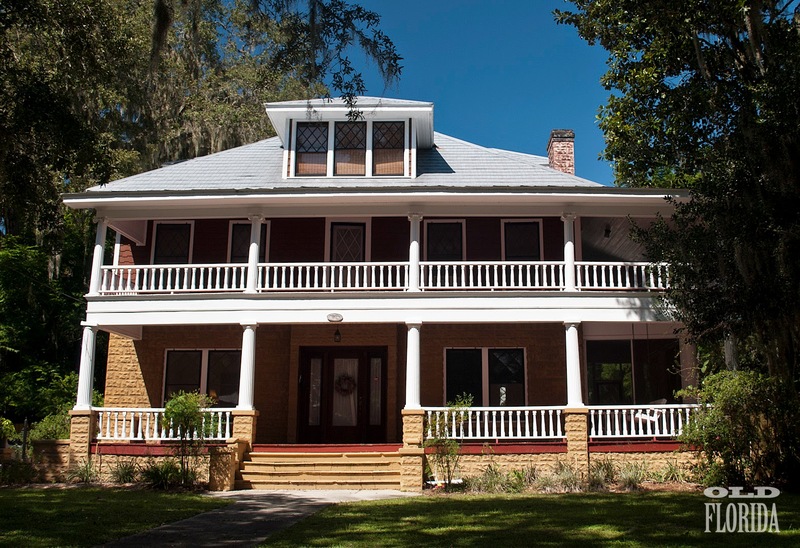 In addition to St. Mark's and the Bronson-Mulholland House, Palatka's Northern Historic District has other wonderful Victorian-era homes. 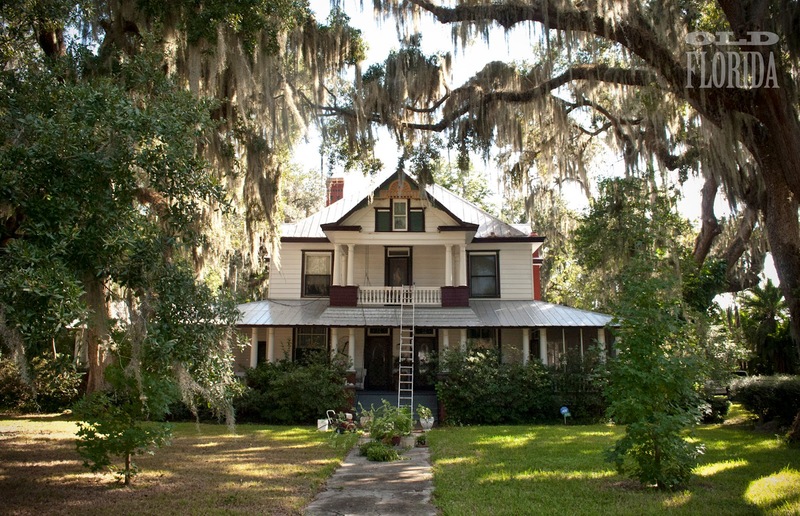 As the owner of a wood frame house, I understand the commitment it takes to maintain an older home. 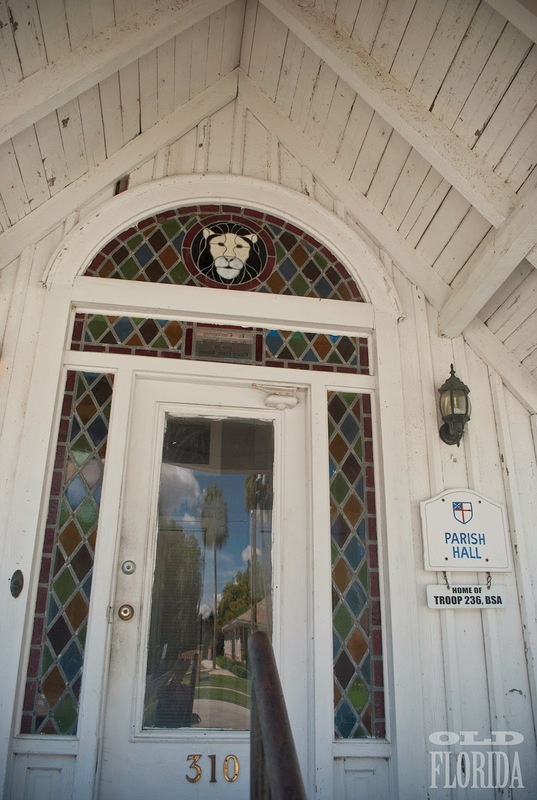 I am thankful for the loving caretakers of these windows to Florida's past.